Tesoro Corp did not adequately maintain a heat exchanger at its Anacortes, Washington, refinery that exploded one year ago leaving seven dead, a safety board said. The CSB released a video that highlights the ongoing investigation into the April 2, 2010 incident. 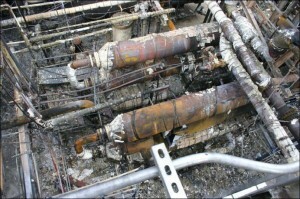 At the time of the incident a heat exchanger was coming online when the nearly forty-year-old piece of equipment catastrophically failed, spewing highly flammable hydrogen and naphtha which ignited and exploded. Microscopic cracks had formed in the walls of the exchanger in a common phenomenon seen in metal where hydrogen is present under high temperature called high-temperature hydrogen attack, said Moure-Eraso in a video. A Tesoro spokesman said the company does not agree with the CSB’s assessment about maintenance at the refinery. “The Tesoro accident is only one of several fatal incidents that occurred in the oil and gas production and refining sector in 2010 alone. Serious incidents at refineries continue to occur with alarming frequency,” Moure-Eraso said. The video notes insurance industry statistics indicating the U.S. refining sector has more than three times the rate of property losses of refineries overseas.